Tired of waiting for the garden to start blooming again I went to the Dupont Circle Farmer’s Market today to purchase some flowers. Using what I’ve grown or collected has been a pretty good feeling, but after days of barely being able to glean enough worth while materials to work with I had to buy flowers. The upside is that they are locally grown by Farmhouse Flowers and Plants and they are beautiful. I selected some orange cockscomb and multicolored stems of cosmos for a summery feel. After I got home I went for a walk to gather some grasses to add some movement to the ikebana arrangement. 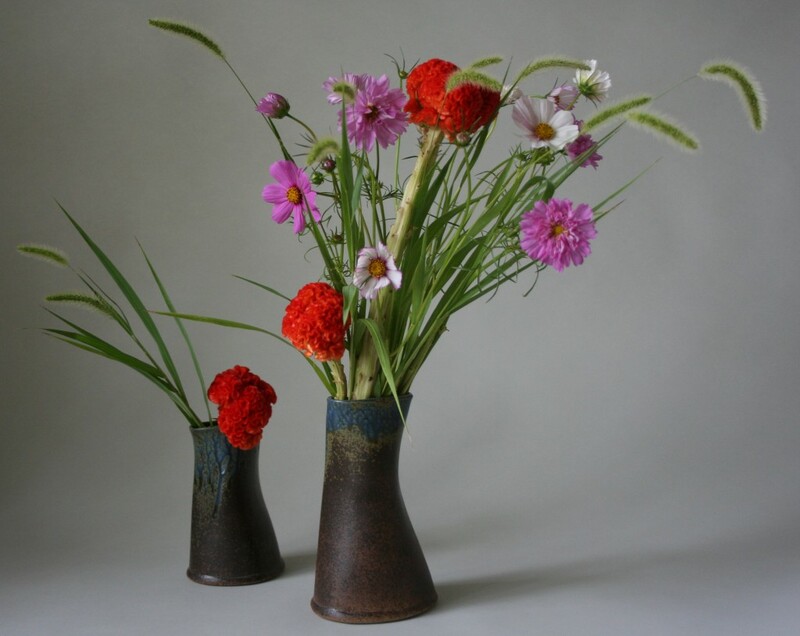 The ceramic vases were bought years ago at my first North American Sogetsu Seminar in Portland, Oregon. Today they were used for the very first time, as previous attempts just didn’t make the grade. Today they added to the movement and feel that I wanted of a field of flowers in late summer.